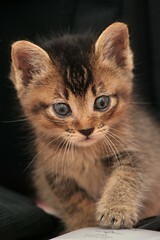 Kittens grow up from the most fragile little creature to the most lovable and fearless acrobat in the animal planet. But during their first stage of life, a significant care of kittens is one of the crucial process in the cat’s tenacious life. Raising kittens is a decision you can never let go. Before anything else, consider every factors in your household, such as physical and emotional preparedness, budget, family condition, and other pets. The first thing you have to do when caring for kitten is giving the newborn warmth. Do some physical examination and provide the little one food.